September 30, 2014 In News What is Michelle doing now? 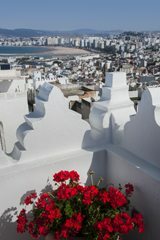 La Maison Blanche is a luxurious boutique hotel (Riad) situated in the heart of the Kasbah (old town) of Tangiers. Opened a year ago, it has just nine rooms, with a roof terrace offering spectacular views over the city. A typical bedroom at La Maison Blanche. The owners, Pilar and Aziz, take a very hands-on approach to the running of their business with enormous attention to detail.This can be seen throughout the hotel, from the locally-sourced Moroccan hand soaps to the hand-crafted, mosaic-tiled floors. 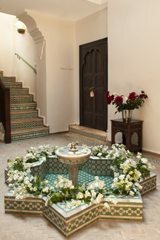 Mosaic-style water feature at La Maison Blanche. This was a three-day continuation shoot from the initial one in December 2013,to add to their image library. The shoot included shots of the solarium, the welcoming hospitality and the picturesque entrance hall, as well as the rooms and bathrooms. The photos were taken using HDR and ‘strobist’ techniques. 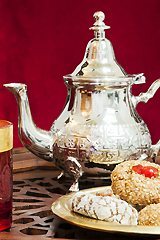 Detail shots of Moroccan teapots, glasses, cakes and water feature were also included. It was a very successful trip and one that Michelle always enjoys. The Fiesta de la Vendimia (Grape Harvest Festival) takes place all over Andalucia every year during the month of September. This year, Michelle attended the festivities in Manilva, a village in Malaga province, where she experienced the blessing of the grapes, possibly the most important event of the festival and then took photos of the treading of the grapes, marking the beginning of the harvest. She also took photos of the drinking of the first juice, which brings good luck to all who take part! 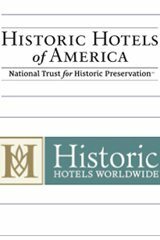 In May 2014, Michelle was honoured to be invited to deliver a keynote speech on the importance of photography for historic hotels at the Historic Hotels of America Annual Conference in October, taking place at the Hotel Hershey in Pennsylvania, USA. How to get more from your photographer (as a hotelier). This will include Michelle´s personal predictions on future trends of hotel photography. A view to the beach from the roof terrace. The entrance hall and stunning water feature. A grape treader in action. A close-up of the treading of the grapes.